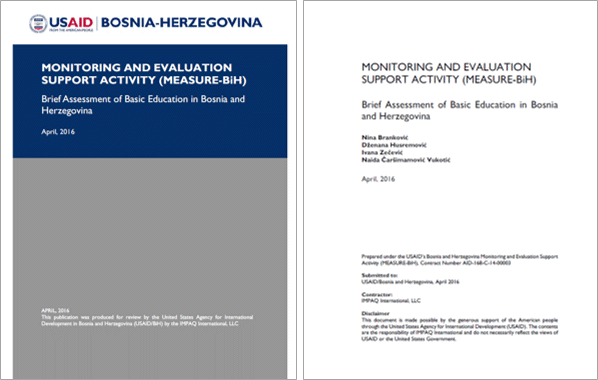 Basic Education Assessment was conducted by MEASURE-BiH with the objectives of i) assessing the current situation and reform processes in basic education in BiH, including ongoing interventions and reform processes led by the BiH government and donors; and ii) providing recommendations for USAID/BiH on how to program its potential basic education funds in 2016 – 2018. What is the general picture of the basic education system in BiH? What is the current situation in the education reform processes? And what are the most important challenges? Which recent and ongoing interventions and reform processes have been led by BiH government education institutions and major bilateral and multilateral international donors? What are the most important challenges that could be the subject of a possible USAID/BiH basic education interventions in 2016–2018, based on gaps identified from situational analyses and gaps in ongoing interventions? The methodology we use was designed to ensure systematic and efficient collection of data and triangulation of information across different sources and methods. Based on the findings of our assessment and lessons learned from other donors that have implemented basic education interventions, we identified eight possible basic education interventions. We then also prepared a separate Brief on Recommendations for USAID/BiH Interventions in Basic Education providing the background, rationale, and inputs for possible program description for the top two out of these eight recommended possible interventions.